The Township of the Archipelago and other nearby municipalities do not provide fire protection of any kind for the Kapikog Lake area. Although there is a fire station in Mactier, cottagers should not expect them to respond to a fire at Kapikog Lake. 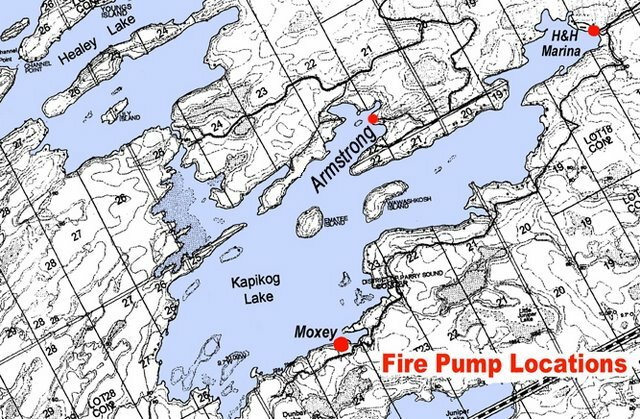 Nor does the Cottagers Association provide fire protection services, however it has installed high pressure pump/hose units at three different locations on the lake which may be borrowed by cottage owners or their representatives to fight fires at their own risk. The effectiveness of such an arrangement depends largely on the users involved and their knowledge of the pump locations and operating procedures, therefore you are urged to attend a demonstration, read/reread the instructions under this topic and ensure that you are capable of using the equipment in an emergency. These pumps and associated equipment are provided on a best efforts basis and the Association assumes no responsibility for their reliability or for injuries to anyone using this equipment.